Bio: ​Born in China, Vivian spent the first thirteen years of her life in Dalian, an awesome city on the northwest coast near Korea and Japan. Vivian spent one semester of fifth grade in Terre Haute, Indiana, and later moved back to China because she missed her friends and grandma. Vivian had so much struggles with her 7th grade physics in China so that she decided to come back to the states where she can get effortless straight A's and eat her favorite Starbucks icecream that no longer exist these days. 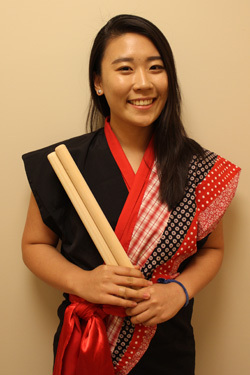 Growing up with the Japanese culture influences in her hometown, Vivian had developed her huge passion and picky taste for Japanese food but had never seen taiko ever. When she first arrived at Cornell freshman year, Vivian saw a Yamatai performance during orientation week and was fascinated by it. Vivian tried out for Yamatai and got rejected freshman year. So she triedout again her sophomore year and finally became a part of the YAMATAI FAMILY! !